For almost four years I’ve been working on a manuscript called ‘The Trivia Man’. Because there were other novels to write, I couldn’t devote myself to the project full-time. Instead, it became a dalliance taking place whenever I found myself between books. An on-again, off-again relationship that I thought I could control, until it got out of hand and I didn’t want to write anything else! So, who is this fictional guy monopolising my time? Well, he’s a middle-aged forensic accountant by the name of Kevin Dwyer whose life revolves around his weekly trivia night. And why did I choose trivia as his obsession rather than golf or ballroom dancing or even poker? The answer is personal. You see, I was a trivia buff, long before there were trivia contests, pub quizzes or a board game called ‘Trivial Pursuit’ – in fact, long before people ever used the term ‘trivia’ to refer to knowledge both general and esoteric. Like my protagonist in the novel, I was a child who just loved accumulating facts. But in a pre-internet world, facts weren’t as easy to come by as they are now. There was no Google to do the searching for you. Instead, you had to go to the local library and leaf through weighty reference tomes such as the ‘Encyclopaedia Britannica’. And although those revered volumes contained a lot of information, it was mostly of the serious, mainstream variety – geographical facts, scientific phenomena, famous people, historical events and so on. But where could you find those idiosyncratic tidbits you desperately needed to know: the lyrics to a half-remembered song, or the name of Superman’s mother* or Hopalong Cassidy’s horse**? If, like me, you were also a movie buff (yes, we’re talking about a very nerdy child here), and you were trying to recall the title of a particular film or the name of a character or a member of the cast, there was no Internet Movie Database (imdb) to assist you. You had to go to the library shelf numbered 791.43 and browse the movie books. What are the names of the original Mouseketeers? How many cities/towns in the world are called Sydney and where are they? I could go on indefinitely but you get the drift. Nowadays you can find the answers in a matter of minutes, thanks to Wikipedia. In the past it involved patient and painstaking investigation skills. And even then, you might not succeed in your quest. Those of us intrigued by informational minutiae never think of it as being trivial. Quite the contrary. We believe those little pieces of data constitute the essence rather than the periphery. After all, the devil is in the detail. By the way, my next novel, ‘The Trivia Man’ will be released on 1 June 2015. Read more here. One afternoon last week I was pulling into my drive when I spotted a dog exactly resembling mine, even to the pink jewelled collar, trotting down the road behind a man carrying a tablet device. My first thought was that my kelpie, Angel, had finally managed to chew through the wire which covers the bottom of our gate and escaped into the street. But when I hopped out of the car and approached the dog, I noticed she was almost a Doppelgänger for Angel, though not quite. Angel has a small white triangular patch on her nose, this dog's face was entirely black. ‘Is she your dog?’ I asked the man with the iPad as he stopped to examine my water meter. Then he continued briskly on his way with the pooch close behind him. If this dog lives in River Drive, I thought to myself, she’s heading further and further from home. Instantly she obeyed. I checked her fancy pink collar for an ID tag. Nothing. I patted her soft, glossy coat. She leant against my leg and gazed up at me with the most gorgeous hazel eyes. Dear Reader, I was smitten. It was a hot day, so I took her into my backyard for a bowl of water. Angel, who had been snoozing in her kennel, popped her head out and thought she was dreaming. Soon the two of them were playing as if they had always been buddies. So much for all those warnings about two female dogs not getting on. ‘We have a visitor,’ I called out to WGH* who was at home working in his study. At first he wondered if he was seeing double. We decided to put the mystery dog on a lead and walk the length of River Drive. Maybe we could find her owner, or at least someone who recognised her. Perhaps she might even recognise her own house and start barking. Unlike our own dog who pulls so hard on the lead that I’ve developed gorilla arms, this little dog behaved perfectly, walking at an even pace and never straining. As we passed people in their gardens, we asked if they knew her. The answer was invariably ‘no’. I looked at my watch - 5.30pm - too late to call the vet about a microchip. So we returned home, no closer to solving the mystery of Angel’s Double. Soon it was dinnertime. Angel gobbled hers down; the new dog ate slowly and politely. Then they chased each other round the yard for an hour or two and slept soundly through the night. Not even the howling of a libidinous possum could wake them. Meanwhile I was busy at my laptop, posting pics of the mystery pooch on Facebook and asking locals to share them, which they kindly did, but without success. Almost 800 people saw the post that evening but nobody recognised the dog. Curious. So I stayed up till midnight, designing posters to distribute around the neighbourhood. But I have a confession to make - in my heart I was hoping that nobody would claim the mystery kelpie - even though common sense told me that a well-groomed, well-trained dog must have a loving owner. In the morning the new dog seemed unsettled. ‘She’s pining for her family,’ WGH said. ‘I know,’ I replied, picturing little children crying for their lost dog. At eight-thirty sharp, I phoned our vet and asked if they could check whether the dog was micro-chipped. ‘Bring her straight up,’ they said. She hopped into the back of my car as if she’d done it a million times before and I secured her in place. She lay down without being told to. I thought about the direction in which she’d been heading. Yes, it was due north. ‘So I guess we’ve got to hand her over,’ I whispered to WGH. He’d fallen in love with her too. ‘Guess so,’ he replied with a catch in his voice. ‘Coogee?’ I called to her. She turned in anticipation. We looked into the brown eyes, gave her one last pat and headed out the door. At home Angel was waiting. She’d already forgotten about her Doppelgänger and was back in ‘only child’ mode. Later that day I received a phone call from the owner, thanking me for keeping her dog safe. She sounded like a nice person and I could tell by the tremor in her voice that she loved the dog. ‘Such a great outcome,’ a dear friend wrote on Facebook, and of course she’s right. But I still miss Angel’s Double, and so does WGH. Thank you to everyone who entered the Giveaway – I really enjoyed reading through your choices which ranged from 'To Kill A Mockingbird' and 'Cloud Street' to more obscure titles such as 'If on a winter's night a traveller' by Italo Calvino (which I'll be adding to my spring reading list because it sounds so intriguing). Now for the consolation prizes. A signed handmade bookmark goes to each of the following entrants: Catharine T of N. Qld, Chris M of NSW and Judy M also from NSW. If you didn’t supply your contact address in the entry email, would you kindly drop me a line via the Contact page with your details. Also, please let me know the name you’d like me to include when I sign your prize. Prizes should arrive next week. Disclaimer: This giveaway was not sponsored, endorsed or administered by Facebook. Spring is the perfect time for creating art projects to decorate your home. That’s why I’m giving away a signed copy of my bestselling DIY book, 'Folk Art of France', which was released in Australia, New Zealand, Europe and North America. It's now out of print but this copy is in mint condition. The book is 144 pages in length with line drawings and full page colour photos. Painting projects include a coffee grinder, pepper mill, cutlery box, menu board, set of canisters, watering can, cow bell and heirloom clock. There are step-by-step painting guides, full-size patterns and superb colour photography by Rodney Weidland, plus comprehensive instructions and a history of decorative art in France. WGH* and I drove more than 4000 kilometres across the back roads of France to research this book - from sparsely populated Savoie-Dauphine to the Riviera, Dordogne, Loire Valley, Ile-de-France and northern France. As you can see from the pic below, it was hard work! But seriously, I also filled a number of sketchbooks with material. Here's a page from one of them which I did during a visit to the Musee Fabre in Montpellier. And below is a picture of the peppermill I painted for the book, inspired by the rose I sketched on the top left of the page. I just loved the colours. Here's a coffee grinder painted with roses inspired by Sevres porcelain. I love this project. I'm also giving away consolation prizes of signed handmade bookmarks. The closing date is midnight Monday, October 6, 2014. 1. Just send me an email or leave a comment on my Facebook page, telling me your favourite book of all time. 2. Like my Facebook page if you haven't done so already. You’re most welcome to enter, even if you’ve won a prize in a previous Giveaway. But please, only one entry per person. And who’s the judge? Me, of course. The fun part of running a giveaway is reading through the answers. Please note: I’ll sign the book and the consolation prizes for whomever the winners nominate. This giveaway is open to Australian residents only. Entries close at midnight on Monday, October 6, 2014 (wherever you are in Australia) and I’ll be notifying the winners in the following days so that they can get in contact with their mailing address. After that, I’ll gift-wrap the prizes and put them in the post. Please note that I’ll be publishing the names of the winners here but will only use first name and initial of anyone who enters. *WGH = World's Greatest Husband - it says so on his coffee mug. Disclaimer: This giveaway is not sponsored, endorsed or administered by Facebook. 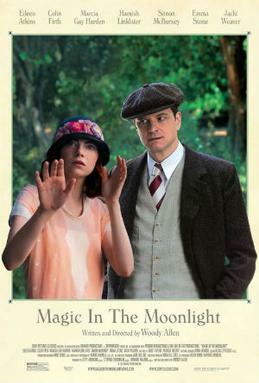 If I didn’t know who had directed ‘Magic in the Moonlight’, I would find it difficult to believe it’s a Woody Allen film. Apart from the thread about the supernatural versus rationalism which is decidedly Allenesque, this fluffy romantic story about a famous illusionist (Colin Firth) sent to unmask a pretty young clairvoyant, Sophie (Emma Stone) might have been concocted by someone else altogether. All the same, there is much to like about the film, starting with the setting – the Riviera in 1928, which provides the opportunity to dress the cast in elegant 1920s costumes and place them in stunning locations – from cliff tops overlooking a dazzlingly blue sea to gorgeous villas surrounded by terraced lawns and gardens abloom with irises and hydrangeas. Then there’s the delightful soundtrack featuring numbers such as Cole Porter’s ‘You Do Something to Me’ (which also made a brief appearance in ‘Midnight in Paris’) as well as some stirring classical interludes by Beethoven and Stravinsky. As usual, Allen has assembled a solid cast, headed by Colin Firth as magician extraordinaire Wei Ling Soo, who’s really an Englishman by the name of Stanley, a self-obsessed and supercilious boor. In fact, he could easily be a 1920s version of Jane Austen’s Mr Darcy. Just as he did in ‘Pride and Prejudice’, Firth manages to inject some of his trademark charm into the otherwise arrogant and cynical character. And just an aside – when I saw Firth in the opening scene, made up to look stereotypically Chinese, he reminded me of British actor, Robert Donat in ‘Inn of the Sixth Happiness’. I wonder if anyone else has noticed the resemblance. The film is graced by fine supporting performances: the ever dependable Eileen Atkins as Stanley’s aunt, the ubiquitous Simon McBurney as Stanley’s school friend and rival magician, and Jackie Weaver as the rich widow with the Bronx accent, longing to make psychic contact with her dead husband. Although the character as written tends to be one-dimensional, Weaver does her best to impart depth to the role and being a very fine actress, she succeeds. Where the film falters is in the writing. There are scenes between Stanley and Sophie towards the end in which the dialogue is repetitive and self-indulgent. Why didn’t someone tell Woody Allen he needed to do some pruning? I guess the answer is obvious – when you’re dealing with an auteur of his standing, you’d be apprehensive about offering advice like that. ‘Magic in the Moonlight’ is 100 minutes in length but seems longer. Having said that, Allen's plot does offer some neat twists and turns, leading to a charming resolution. In summary, ‘Magic in the Moonlight’ isn’t in the league of ‘Annie Hall’, ‘Radio Days’ or ‘Midnight in Paris’, but it’s an enjoyable piece of nostalgic escapism nonetheless.